My most recent curatorial project, Framing the Field: Photographic Terrain in the Collection of the Minnesota Museum of American Art, is on display from February 4 to March 28 at the Catherine G. Murphy Gallery at St. Catherine University in St. Paul. The show includes 39 works by 36 artists. All the photographs were made within the last 40 years, since the time I started junior high school in the Twin Cities. The show is not about landscape as a visual genre, nor does it consist entirely of photographs of land and nature. Rather, the framing devices of “field” and “terrain” focus attention on the entirety of a collection and the ways in which it maps the contemporary evolution of photographic art. There are many pieces in this show that I have admired over time. Some of which I owned for a while, then donated to the museum (MMAA for short) in recognition of a former director who was a friend and a great supporter of photography. This image, by Minneapolis-based photographer Jerry Mathiason, was given to MMAA by Mathiason in 1989. It is full of genius loci, or spirit of place. I don’t know exactly where this place is. And I don’t really care. The photograph itself, its tones, shapes, textures, the synthesis of its component parts, is the place. A range of grays implying a world. The universe in a grain of sand–or a blade of grass. I can linger in this place, I can enter it or view it whole. I can reach in and feel the amassed, aging hay. 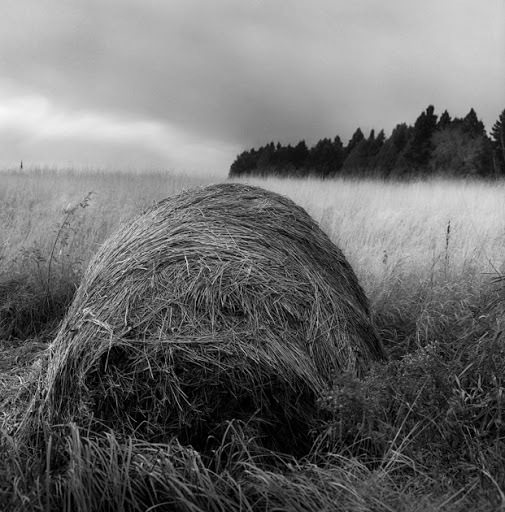 I can hear the grasses, swishing from wind and my boots, yet to be transformed into hay. I can almost smell the cool cedars, see the fibrous bark that, shaved and scraped into cottony wads, makes for excellent fire starter. I can fear the fire that might take this whole scene into another, darker spectrum. As I stare my vision goes soft and the slouching bale becomes another structure, of Indian derivation, using cedar bark and branches to fashion a structure bulging roundly from mother earth. Whether wigwam, waginogan, or wickiup, I squint my eyes a bit and see it there on the prairie, the dark line of cedars a trail of smoke from the cooking fire inside, an interior further suggested by the dark hole admitting entrance. The grand scale of this space is evident from both the depth of the focused field and the gradations of light across the dried grasses. The ground makes a screen large enough to capture the variable glow projecting from the sky above. When my vision sharpens again I revel in the infinite variability of lines drawn on film by both the hewn and uncut foliage. Deepening my focus I consider the energy invested in baling this hay, the attempt to bind and thereby retain the nutrition latent in the grasses. And then, the release, letting that bale soften, lose its focus, return to the soil. A puzzle in that, the invested energy going to waste. Maybe another story about why. And the eternal story of cycles, of will and neglect. In the show, nearly every photograph has three subjects. First, what it shows–its content. Attached to that are formal issues, which extend to its place within the entirety of the exhibition. And finally, each photograph relates another topic, somewhat theoretical, philosophical, or symbolic in nature; that would be its implications. What does the photograph tell us about what we can’t see, what can’t be shown? This, to me, is photography’s most wondrous terrain.